Were you ever disappointed on Christmas morning? Join the club. My first seven Christmases were supreme disappointments. Every blooming one of them included some kind of doll as my “big gift,” which I, odd little girl that I was, promptly set on a shelf and ignored the rest of the year. Dolls were just so, so, well, just so useless. On my eighth Christmas, my parents gave up – finally. There were no dolls that Christmas, and it was the best Christmas of my life. Not one since then has ever come close. No offense intended to my loved ones, but it’s the truth. require a great deal of reflection. As many odd children do, I’d worked out the Santa Ploy well before age eight. I had no misconceptions about the source of Christmas bounty: my parents got all the credit. That Christmas morning, my parents basked in the glow of gift-giving as their extraordinarily odd little girl thanked them profusely for gifts which were her heart’s delight. A hefty, 512-page version of The Illustrated Treasury Of Children’s Literature, filled with my old favorites and many which would become my new favorites. A three-volume set of Little Women, Five Little Peppers and How They Grew, and Heidi. A small collection of books illustrating fish and birds I’d never heard of or seen. Tracing books with delicate pages of onion skin paper interleaved with thick yellowish pages. Waxy smelling crayons and pine-scented colored pencils. And, wonder of wonders, my very own hole punch and stapler. What more could an academic, even as young as myself, ask for?! A lot, figured my parents. Everyone knows Christmas gifts are always under the tree. I decided to humor them anyway, put the books down, and take a quick scan around the living room. And “what to my wondering eyes should appear”? Discreetly placed against the west wall, sort of hidden behind two easy chairs, was my very own, child-size desk! Yes! A DESK! No more using a wimpy shelf in a corner of the kitchen. No longer would I have to confiscate some pitiful little stool and turn it into a make-shift desk. I had a real desk, painted chocolate brown and cream yellow to match my room, of course. A DESK! With its own little brown-and-yellow stool! And drawers – no-nonsense drawers to house all those coloring and tracing books! And a top middle drawer – for the hole punch and stapler, of course, and the other necessary desk accoutrements I would no doubt acquire, now that I was a legitimate desk-owner. I’d died and gone to heaven. There was simply no other reasonable explanation. My new responsibilities as an odd-child desk owner took so much time that Christmas holiday, I scarcely had time to read all my lovely new books, which just goes to show what a perfect gift it was. I, who loved reading above all else, was spending my time dragging the desk from room to room, arranging and rearranging all my new desk accessories, and learning to type, sort of. As any desk-owner knows, it takes time to get your stuff allocated to its most useful and proper place in a new desk. When the holidays ended and I found myself back into the homework routine, I soon learned that serious concentration in the middle of a kitchen is a bit of a chore. Desks, it seems, are usually better situated in more quiet places, e.g., bedrooms and studies. As I gave in to my parents’ color-coding hint and settled the desk and myself into a corner of my bedroom, I began to feel quite comfortable as a desk-owner. A little too comfortable. By the end of school, I am very ashamed to tell you, I’d grown blasé about being a desk owner. And isn’t that how it goes? How quickly we assume something is our due and forget how fortunate we are to have it. 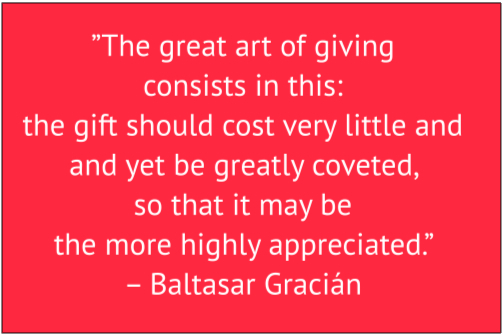 Even at the tender age of eight, after receiving the gift over which any odd little girl would salivate, I forgot how precious the gift and the thoughts behind it were. 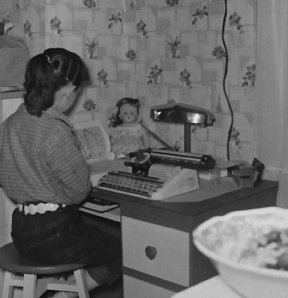 Have you ever known an eight-year-old girl to grow rhapsodic over a Tiny Tot stapler, a hole punch, tin typewriter, or home-made desk? See? It just gives fresh credence to my admission of oddity. Oh, but it gets even odder. Check out ODD #9.